Galician philosopher and writer; born at Brody about 1823; died in 1895; son of Nachman Krochmal. Very littleis known of his life. He seems to have received an Orthodox education, which included, however, modern science. In 1830 he lived at Odessa, but after a short time he went to Galicia, where he probably remained until his death. 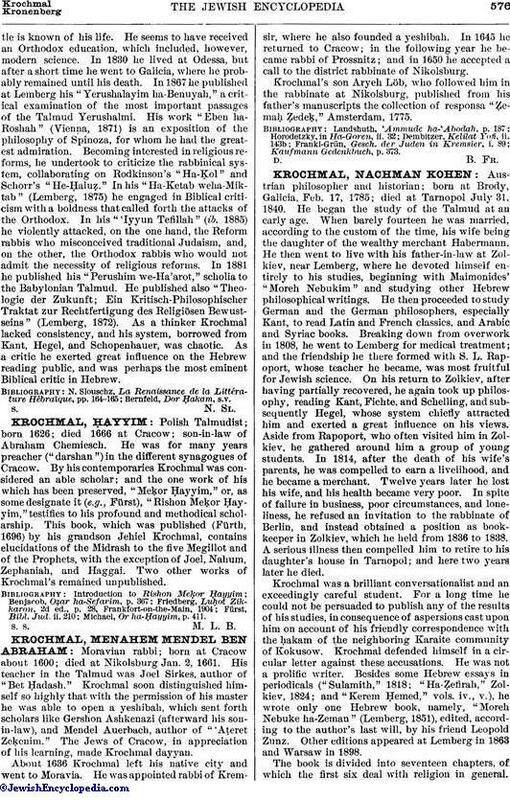 In 1867 he published at Lemberg his "Yerushalayim ha-Benuyah," a critical examination of the most important passages of the Talmud Yerushalmi. His work "Eben ha-Roshah" (Vienna, 1871) is an exposition of the philosophy of Spinoza, for whom he had the greatest admiration. Becoming interested in religious reforms, he undertook to criticize the rabbinical system, collaborating on Rodkinson's "Ha-Ḳol" and Schorr's "He-Ḥaluẓ." In his "Ha-Ketab weha-Miktab" (Lemberg, 1875) he engaged in Biblical criticism with a boldness that called forth the attacks of the Orthodox. In his "'Iyyun Tefillah" (ib. 1885) he violently attacked, on the one hand, the Reform rabbis who misconceived traditional Judaism, and, on the other, the Orthodox rabbis who would not admit the necessity of religious reforms. 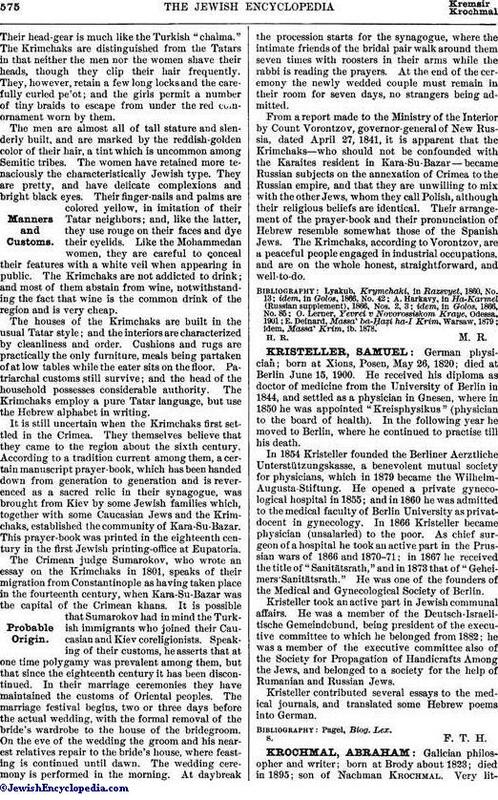 In 1881 he published his "Perushim we-Ha'arot," scholia to the Babylonian Talmud. He published also "Theologie der Zukunft; Ein Kritisch-Philosophischer Traktat zur Rechtfertigung des Religiösen Bewustseins" (Lemberg, 1872). As a thinker Krochmal lacked consistency, and his system, borrowed from Kant, Hegel, and Schopenhauer, was chaotic. As a critic he exerted great influence on the Hebrew reading public, and was perhaps the most eminent Biblical critic in Hebrew.